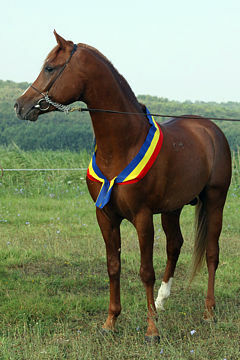 AL HAMAAMA, Dark Bay Mare, *1990 (Golden Decimus/Halima). 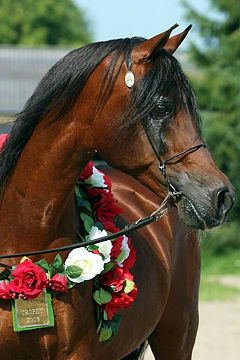 Bred and owned by The Royal Jordanian State Stud. 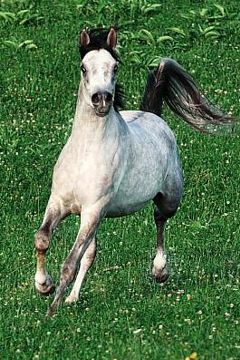 Strain: Kehailet Umm Argub (Nasseb). 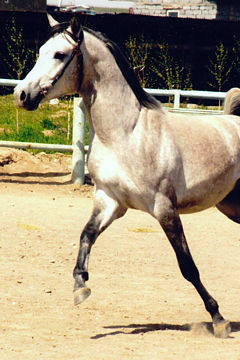 Al Hamaama, now aged 18, was selected as this year’s WAHO Trophy winner in recognition of her outstanding contribution to the breed in Jordan as well as to Jordan’s reputation abroad. 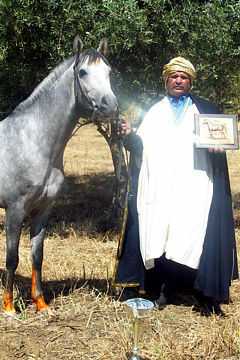 Al Hamaama represents the Jordanian and quite rare strain of Umm Argub. 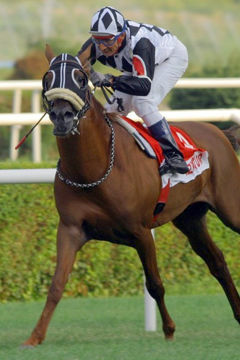 Her dam line traces to Sabal II who was a brilliant racehorse over all distances, while her sire Golden Decimus (GB) was a very successful endurance competitor as well as sire. 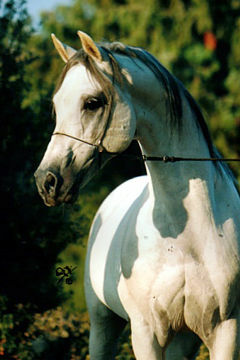 Victorious in the show ring in her own right, Al Hamaama won the Reserve Best Head title at the Mediterranean & Arab Countries Championships in Menton, France, in the 1990’s. 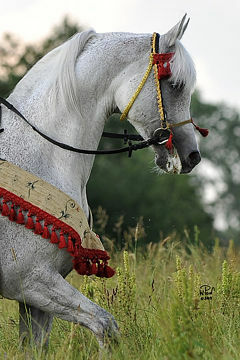 She and her daughter Al Yamaamah (by Abakan) have frequently shared the winner and reserve placing in that category at the Jordan Nationals as well as at the Middle East Championships in Amman. 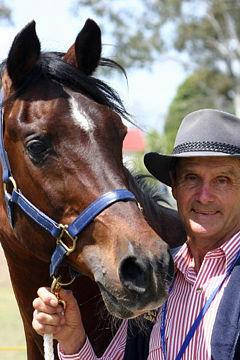 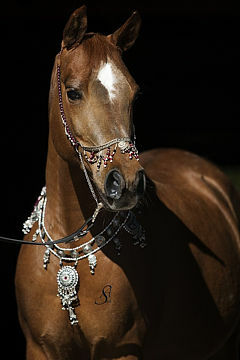 She has also both won herself, and contributed to her dam Halima, winning Best Mare Produce Group, or Reserve, several times at the Jordan Nationals and the Middle East Championships. 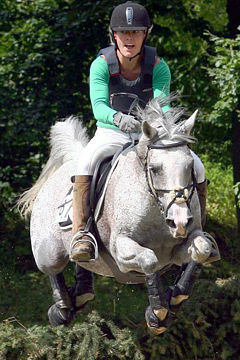 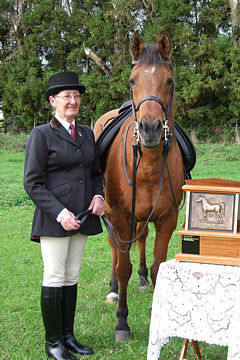 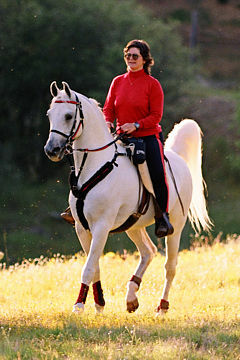 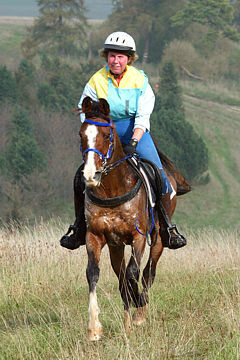 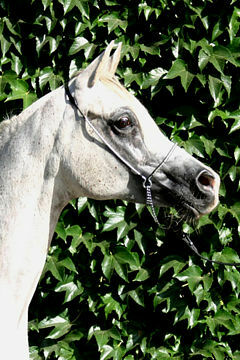 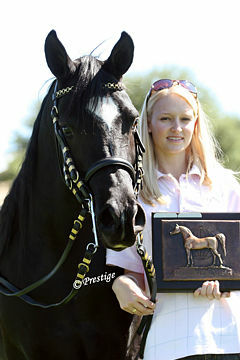 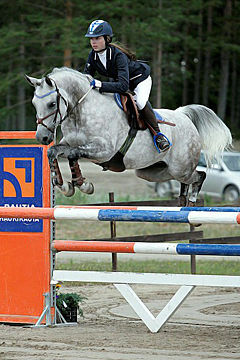 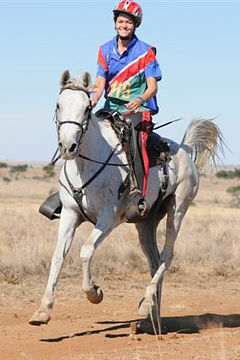 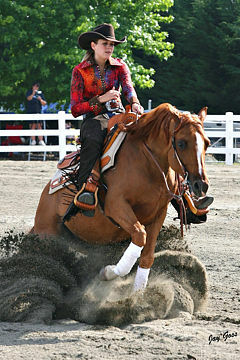 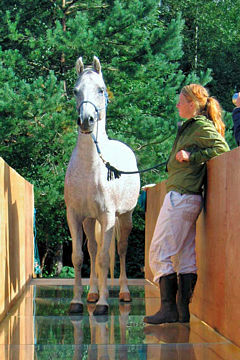 Her progeny and descendants have represented Jordan at shows in Paris, Holland, Austria and Belgium, as well as at the Jordan Nationals and Middle East Championships – where they have garnered many titles, some of them repeatedly, including Reserve National Champion, Middle East Top Ten, and the four separate Highest Points categories for Jordanian born, for Middle East born, for a horse with Sire and Dam born in Jordan, and for a horse with Sire and Dam born in the Middle East. 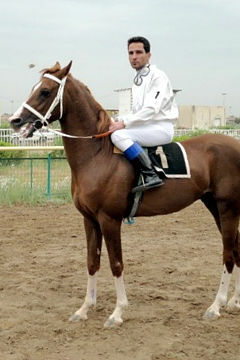 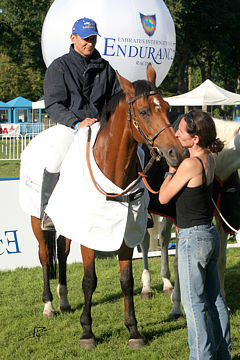 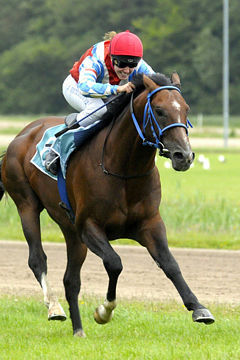 Al Hamaama’s daughters have proved to be very important broodmares in their own right at her maternal Stud, and her descendants also grace the Royal Stables of Bahrain (daughter Al Hasna by Abakan) and the stud of HH Sheikh Sultan Bin Zayed Al Nahayan in Abu Dhabi (great grand-daughter, Hilwah by Hlayyil Ramadan). 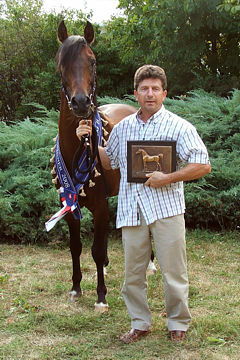 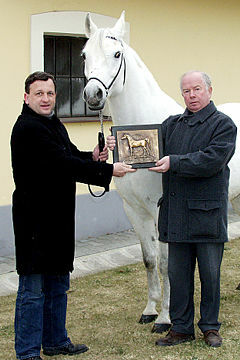 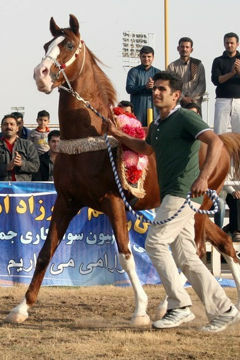 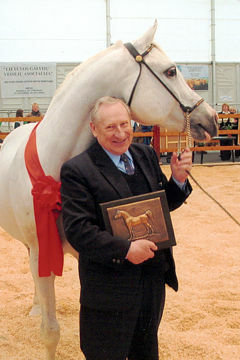 This year her grand-daughter Yusra won all four categories for Highest Points mentioned above at the Middle East Championships and had the 6th highest points of the whole show, while her great grand-daughter Hoor won the title of Filly Foal Champion and Best Female Head, with her maternal aunt Al Yamaamah as Reserve. 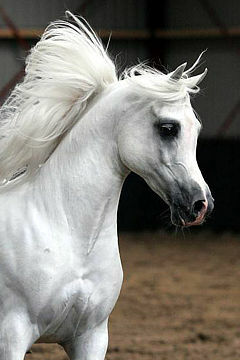 (MaShaAllah to all of the above). 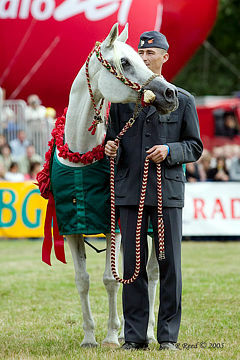 Very much treasured at the Royal Jordanian State Stud, it is clear from all the above that Al Hamaama truly earned her WAHO Trophy and Princess Alia Al Hussein Al Saleh, who personally presented the award, felt that Al Hamaama seemed pleased as she accepted it with – as you can see in the photograph – her customary aplomb and dignity!